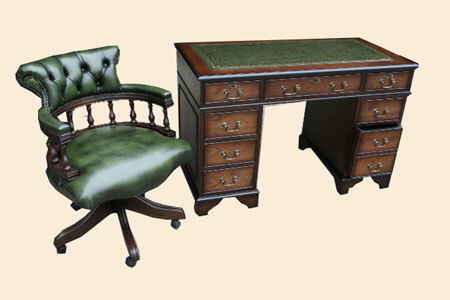 This special offer, newly made range of study furniture, is only available in a Dark Mahogany finish. 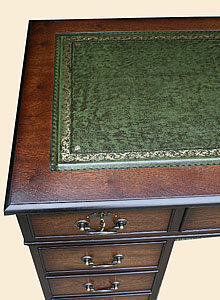 Just One Desk size, which is available with either a Bottle Green or Wine leather top. Options include a choice of two matching Desk/Chair Sets, a matching Two Drawer Filing Cabinet, Open Bookcase and Value Desk Lamp. All items in stock for quick delivery. 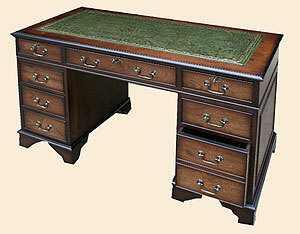 Special Offer Pedestal Desk - A New ,Reproduction Pedestal Desk. Shaped Bracket Feet, three locking top drawers and a double depth drawer on the right pedestal. Mahogany finish only. Choice of Green or Wine leather top. A Dark Mahogany Open Bookcase. Fitted with five loose, adjustable shelves. Deep enough, for large books and box files. Shaped Bracket Feet that match the Desk and Filing Cabinet. Special Offer Two Drawer Filing Cabinet. A Dark Mahogany Two Drawer Filing Cabinet. Two locking drawers, Fitted out for Foolscap suspension files. Shaped Bracket Feet. Choice of Bottle Green or Wine leather top. DC 247 Value Range, Green Shaded, Brass Bankers Lamp. Special Offer Queen Ann Style Wing Chair. A choice of Wine or Green leather upholstery. Cushion seat with deep buttoned back. Polished mahogany legs. Special Offer Queen Ann Style Foot Stool.